An awesome and easy homemade deodorant that actually works, and is great for those with sensitive skin since it doesn’t contain baking soda. My name is Amy and I have a confession: I am super smelly and I need strong deodorant. Back when I first started making my own products, one of the first things I decided to make was homemade deodorant. It was cheaper than buying it, and I had started reading all the terrible things about conventional deodorants and their harmful ingredients (see below). But after using my original natural deodorant recipe for a few years, I started having some serious reactions. I’m talking gross red, painful, itchy, and peeling skin. But many of you here may have had this same problem… hence why you’re here. And this is a post about armpits, so things might get a little personal! 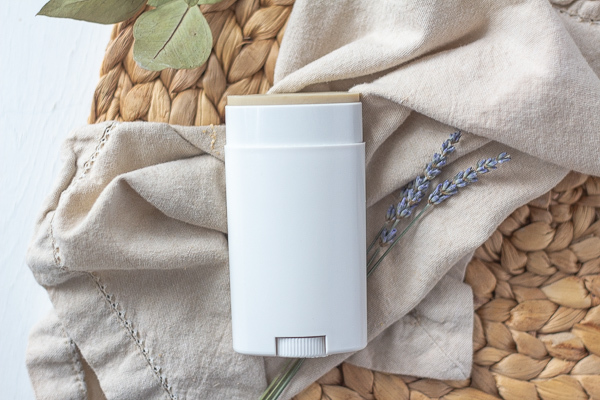 If you’re using natural deodorant and experiencing some (or a lot) of irritation, most of the time, the culprit to this nasty reaction is baking soda. What makes conventional deodorant harmful? It is said that 60% of what you put on your skin will be absorbed. The things we put on our skin can be absorbed right into the blood stream without being filtered through the liver and digestive system like food does. Deodorants can contain many harmful chemicals like fragrance (which is actually a broad term for thousands of chemicals), phthalates, and parabens (which has been linked to breast cancer), all of which are known hormone disrupters. The one interesting thing about deodorant is that we put it on under our armpits (obviously), but that area is right next to very sensitive tissue and hormone receptors. According to Philip Harvey, Ph.D, many chemicals that are found in deodorant are stored in the fat cells in your armpit (source). Aluminum is also something of concern, as although there is no “direct” link to breast cancer, there are some studies showing that there is an increase in breast cancer in the upper quadrant of the breast right next to where those using aluminum products and deodorant would be applied in the underarm area (source). These are just things you want to keep in mind when deciding what type of deodorant you want to use. 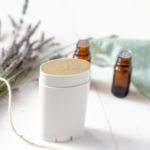 There are great natural deodorant options (homemade and store-bought) out there for those who want to make the switch. How does one make a natural deodorant that works without baking soda? Baking soda is what makes you not smell! 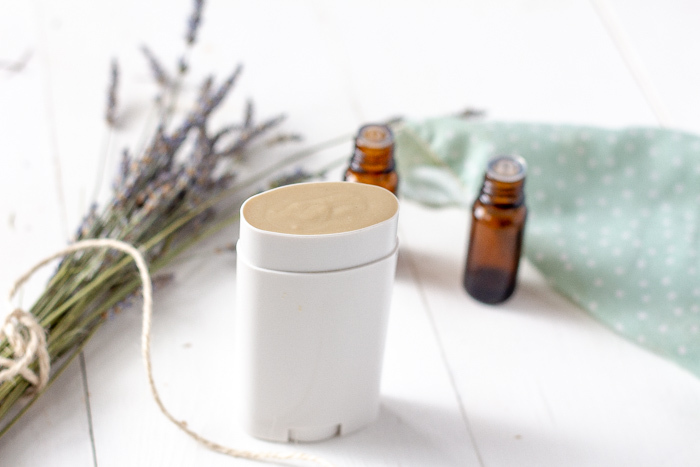 In this natural deodorant recipe, there are two natural ingredients that work to fight odors: diatomaceous earth and bentonite clay! 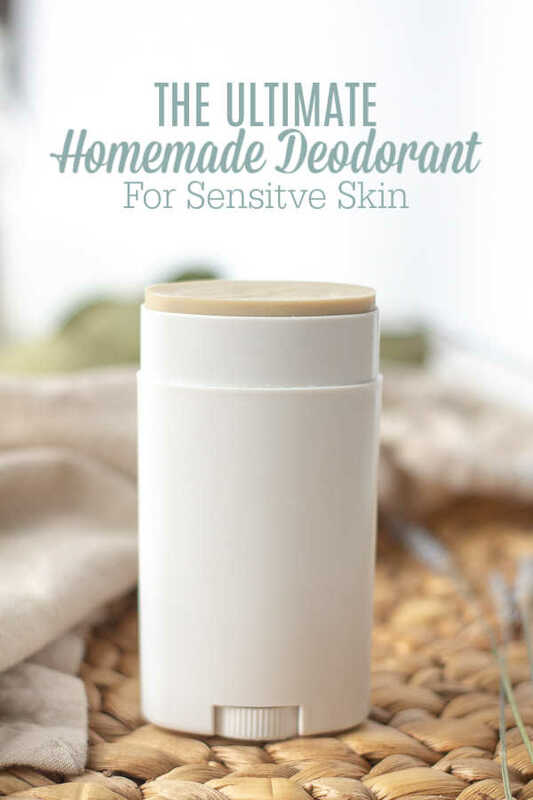 A lot of other store-bought natural deodorants that don’t contain baking soda don’t work very well, so I was determined to create a really awesome natural deodorant that works without using baking soda for the smelliest of people out there. I would know; I’m one of them. My husband can (and would) attest to this fact. I created one a few years back that works well, but I wanted one that was even stronger. You want to know how much I love you all? To test this deodorant, I even worked out for you. That is true love right there. Or if you really want to see if this deodorant actually works, you take a hungry and grumpy toddler to the grocery story. Stress sweat is no joke, and this stuff works like a charm to keep you stink-free in the sweatiest situations. Diatomaceous earth (like this one) and/or bentonite clay (like this one) – these are used for odor protection and detoxification. Organic cornstarch or arrowroot starch – this is used as a natural antiperspirant to help keep you dry. Shea Butter (like this one)- nourishing butter makes a great base that stays solid. Oil – I used avocado, but you can probably use another liquid oil. This helps thin it out and makes it easier to apply, and helps keep your skin smooth. Essential oils – not only do these make you smell pretty, but you can also choose to use some that have antibacterial properties. 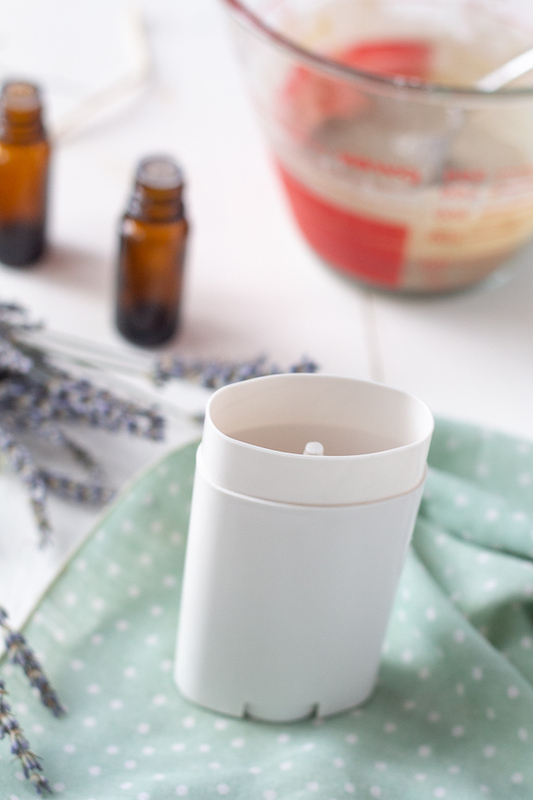 The best essential oils for deodorant are ones that you like the smell of and also have an anti-bacterial property to them. That way, they can help fight off the bacteria that can make you smell. In my first batch, I used tea tree and lavender. I also really like germ destroyer (this is the kid safe version if your pregnant or breastfeeding) or germ fighter. Other great options include: peppermint, clary sage, lemon, etc. I use Plant Therapy essential oils for the great price and high quality. The first batch I made of this homemade deodorant was with activated charcoal, and I used a lot. Lesson learned: it will make everything black. Your armpits, your clothes, your hands when applying… Activated charcoal does an amazing job deodorizing, but I couldn’t be sharing something with you that created black armpits, so I took it out, but if you really need extra extra odor protection, you can add it in. A word to the wise: even the tiniest amount of activated charcoal will change the color dramatically. So only add a pinch. You hear me? A PINCH. It will still make things gray, but not super black. If you would rather buy deodorant instead of making it, I’ve heard really good things about Schmidt’s and Primal Pit (both contain baking soda), and Meow Meow Tweet (no baking soda). 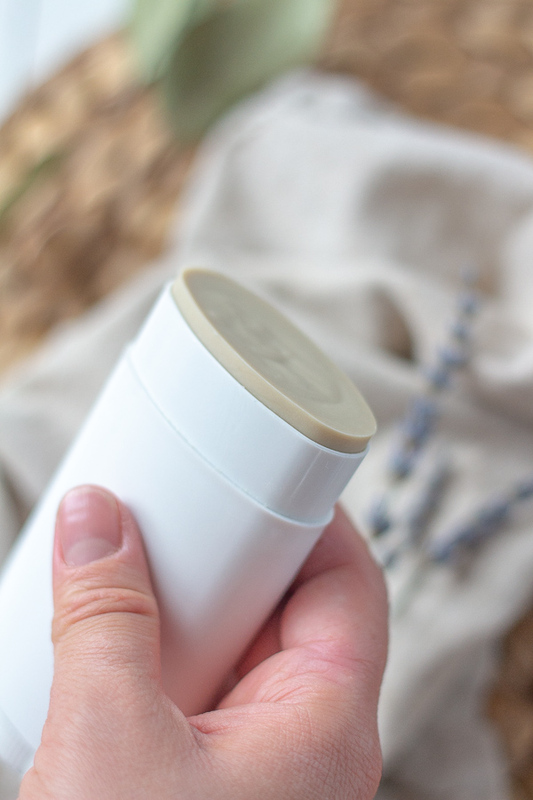 You can place this DIY deodorant in a container and just use your hand, or you can pour it in a deodorant tube for easy use. I took an old deodorant tube and removed the labels. An easy way to remove labels is by peeling off the paper or plastic as much as possible, and then covering the sticky glue with oil, letting it sit a few minutes, and then scraping off the adhesive with a spoon. Then, wash it well with soap. An awesome and easy homemade deodorant that actually works, and is great for those with sensitive skin since it doesn't contain baking soda. In a double boiler or mason jar, mix shea butter and oil together over low heat until melted. Take off heat and add vitamin e and essential oils. Stir well. Add in remaining ingredients until completely combined and smooth. Pour into a jar or clean deodorant tube. Have you tried your hand at making your own deodorant? This looks like a great recipe and I thank you for the testing you endured! How do the armpits of your white shirts and Tshirts look after a day of deodorant? Does the earth/clay leave a stain? Hey Brenda. I haven’t had a issue yet, but I also don’t wear a ton of white shirts besides tank tops. All the products used are white minus the shea butter which is off-white, so I think it should be ok.
Definitely trying this recipe! I have tried SO many deodorants – homemade and bought – that make my armpits itchy and sensitive. The one thing they all have in common is baking soda — which I see your recipe does not have! I hope you love it! It’s amazing how much that one ingredient can impact your skin. This recipe looks great! I’m trying to cut plastic use, so refilling an old deod tube sounds like just the ticket. Never tried using clay before. Looking forward to trying! That’s great Susannah. We try to cut plastic too. I have all these ingredients except for the shea butter, so thanks for that link!! Looking forward to making this! Perfect! I love keeping shea butter on hand, you just never know when you need to make some body butter. It looks like a great recipe what is the shelf life? I just made the recipe but it won’t harden?? Any ideas why? Thanks for all your great recipes! !